Madhouse Records presents ‘Kerri Chandler (Remixed)’ this February, a package including remixes by Detroit Swindle, Josh Butler, Peggy Gou and Jimpster. 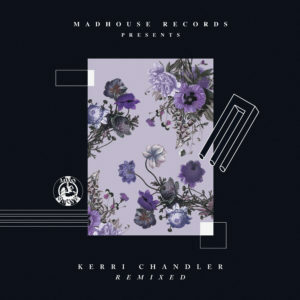 Since Kerri Chandler founded Madhouse Records twenty-five years ago, it has been a reputable outlet for high quality house music, ‘Kerri Chandler (Remixed)’ sees the house music icon’s work remixed by some of the scenes most exciting DJ’s and producers. Heist Recordings helming duo Detroit Swindle continue to establish themselves with regular bookings across the world whilst Josh Butler has become a revered name in house music with releases on Defected, Kaoz Theory, and his own imprint Origins Records, Peggy Gou has become a highly in-demand artist with her productions being picked up by Radio Slave’s seminal imprint Rekids and Jimpster’s twenty-year career has seen the release of three LP’s and a plethora of singles on his very own Freerange Records. Detroit Swindle’s take on ‘Get out’ utilises Kerri Chandler’s own infectious vocal samples from the original, the inaugural release on Madhouse back in 1992, ethereal pads and intriguing synthesiser motifs underpinned by an gritty bass hook. Josh Butler contributes gripping vocal licks and hypnotic chord progressions on top of shuffling percussion and a grooving low-end with his remix of ‘I Got That Feelin’. Peggy Gou’s remix of ‘I Need You’ offers up an array of intertwining melodies with acidic overtones which float above sharp cymbal work and crisp snares before Jimpster’s take on ‘Powder’ provides warped samples from the original, evolving synthesiser motifs and crunching house drums to close the release. Madhouse Records Presents ‘Kerri Chandler Remixed’ drops on Madhouse Records on 9th February 2018 (Vinyl Only). Kerri Chandler Remixed – Out Now!